- Get your spot reserved today. Prime times go fast! FRESNO MUSIC ACADEMY & ARTS? REQUEST INFORMATION NOW - CLICK HERE! Fresno Music Academy & Arts is the largest independent music school in Fresno and the immediate Central San Joaquin valley. We give nearly 325 plus music lessons every week. We are conveniently located in the heart of Fresno's historic cultural center, the Tower District and serve music students from Fresno, Clovis, Sanger, Reedley, Madera and other surrounding communities who visit our studio every week. Others that live a little further away from the immediate area understand that a little extra driving time is well worth the quality of music instruction they receive from our highly qualified music teachers. We even have students that drive in from as far as Visalia and Mariposa to take lessons with us. While you are here researching the best music school for you, please consider the benefits of becoming a student and find out why we are your best choice for music lessons. Do you want to learn at a Fresno Music Academy where music lessons are the most important thing? We are not a piano store or dance studio that also has music lessons, or an instrument retailer that has lessons in tiny little rooms with little or no accountability from the instructors. At Fresno Music Academy, providing you with a great music learning experience is our #1 priority. Fresno Music Academy was established in 2016, formerly known since 1998 as The Voice Shop Music Academy. We teach hundreds of lessons each week to students like you! Your lessons can begin whenever you are ready. Fresno Music Academy operates year-round with new students starting weekly. You and your family can take guitar, piano, voice, drums, bass, violin, banjo, mandolin, ukulele, accordion, ensemble programs, and more! Fresno Music Academy has many instructors, giving you more options for scheduling and musical styles. For your convenience, we are open 6 days per week. Fresno Academy of Music & Arts is the winner of: the 2017 and 2018 Readers Choice Award from California Parent Magazine for the Best Place For Music Lessons in the Fresno county area. Lessons are on-going and weekly (47 lessons/year schedule), and tuition is paid monthly. Take lessons as long as you like. To withdraw from lessons just give Fresno Music Academy a withdrawal notice by the 15th day of your final month. One on one private music lessons are a time honored tradition, and they offer many advantages for you. They provide great flexibility, are easy to schedule, and are available in a wide variety of instruments. They can also provide for an individualized course of study to allow you to advance at your own pace. 8. Multiple family members can take lessons in ONE location. Our busy families with multiple kids and hectic schedules enjoy the convenience of having their children taking different lessons at the same time in one location. We are the only music school in Fresno that gives their students the opportunity to earn special color wristband bracelets (kids and teens love them! ), trophies, AND certificates for passing musical tests. Do other schools offer trophies and certificates? A few. But none of them inspire their students with smiling faces by giving them full color, really cool “Musical Ladder System®” wristbands that they can show off to their friends. The Musical Ladder is our unique method of music education that is not available anywhere else in Fresno, CA. More importantly, when our students have a test coming up, they practice more, their parents are proud, their teachers are proud, and everybody wins. You can only get the Musical Ladder here. Your child can enroll in Fresno Music Academy’s award winning Music Fun Time program. This program is specifically designed for kids starting at 18 months through 6 & 7 years of age. The Music Fun Time program is the only childhood music education program of its kind in Fresno! Our experienced teachers conduct weekly classes with these young children, teaching them music theory, instrumentation, rhythm and more. Based on extensive studies at the John Hopkins institute, children, as early as 18 months can learn music in much the same way as they learn language, sounds, shapes and so much more. A child starting with a musical background will walk away with advantages not available to those who don't. Additionally, many of our instructors have other special training in child development related to music education. Call us at 559-222-7464 and we will help you get your child in the right music program. Your participation in recitals is optional. However, they are a great way for you to grow your talent and confidence. Your instructor will help you or your child prepare for any recital you sign up for. Fresno Music Academy will provide you at least three recital opportunities each year. The regular recitals are in front of a safe and encouraging audience full of students’ friends and family members. See when our next showcase is! Fresno Music Academy is always offering opportunities either for musicians to become better at what they do or for lovers of music and the arts to attend performances. From our summer camps for children, to our summer camp for adults (Front A Band Fantasy Camp), to acting workshops for young adults, plays, concerts and more, we are always focused on performance and building confidence and ability through our many programs. Special classes& programs are announced in our monthly newsletters. Music lessons are offered year round, because that is the best way to learn music. You won’t have to worry about missing lessons during your summer vacation because Fresno Music Academy has an awesome make-up lesson policy. If you need to miss your lesson because you are sick, on vacation, or whatever, you can sign up for free group make-up lessons. That’s right, free! Fresno Music Academy is located at 1298 N. Wishon Ave. in the heart of Fresno's Historical Tower District, just 1 block north of Roger Rodkas . We are open Monday through Saturday, 48 weeks per year. Often times, private music instruction takes place in tiny teaching studios. Fresno Music Academy’s private instructional studios are larger than average. In fact our customers often tell us that our studios are much larger than the competitors. All of our studios are large enough to accommodate a parent sitting in on lessons, and some are large enough for groups and ensemble programs. Additionally, our studios have acoustic treatment to improve sound quality within the rooms. Fresno Music Academy has a large instructional staff providing you many lesson options. All of our instructors have formal music training and/or extensive performing experience. All instructor candidates are subject to rigorous background checks before they can become instructors at Fresno Music Academy. Lessons are first come, first served, so contact us today to arrange YOUR first lesson! 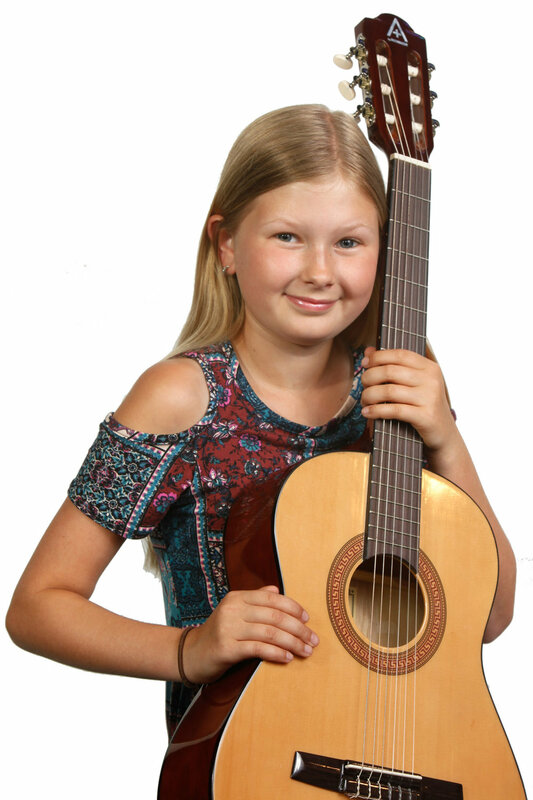 Offering quality guitar, piano, voice / singing, drum, bass lessons and more for students in Fresno, Clovis, Sanger, Reedley, Kingsburg, Selma, Dinuba, Visalia, Hanford, Kerman, Madera, Merced and surrounding areas. $33.75 per 30 minute any private lesson other than voice ($38.75 per lesson), held once a week, 47 weeks/year.